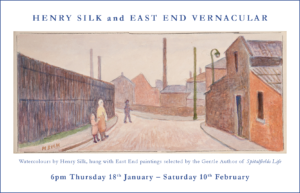 Henry Silk and East End Vernacular is the title of an exhibition currently at Abbott and Holder of Museum Street, London. It celebrates not only the work of the basket weaver and East End Group member Henry Silk (1883-1948) but also works by post-war and contemporary artists who have continued the legacy of the East End Group. The exhibition is a small one, in only two rooms, but it is free to enter and definitely worth a visit. Silk’s watercolours capture the streets, the railways and roads of the early/mid twentieth century East End with directness and simplicity, often using plain flat areas of colour. I particularly like the works which take an unusual or oblique point of view, something which he does often, choosing to paint a cor ner, the rear of houses or the confluence of a number of roads. This show also includes examples of his painting which are less obviously urban. Not just Victoria Park in Hackney, of which there are two views, but also a rear garden and the sea-side (Southend – see right), a Summer House and a summer camp. Silk served in WWI and was drawing during that time, but when he returned home to the East End he studied at the Bethnal Green Men’s Institute and exhibited regularly as an East End Group member. He also exhibited at Whitechapel Gallery for the East London Art Club and the Toynbee Art Club and his first solo show was in the Cork Street galleries of Bull & Sanders Ltd in 1931. The Tate Gallery purchased works as did collectors from the U.S.. Silk was unmarried, living at his sister’s house in Bow, which features in a number of his interiors. The paintings are for sale and prices range between £750 and £3,000. The second room of the exhibition includes examples, not of East End Group members contemporaneous with Silk, but with artists who painted the same streets post WWII and later. 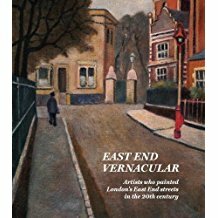 Curated by The Gentle Author, a fellow blogger at Spitalfields Life and also the author of East End Vernacular (2017, Spitalfields Life, £25) a beautifully illustrated catalogue of artists who drew or painted the East End from 1804 to 2013. These includes the famous, such as Gustave Doré and James McNeill Whistler (though they feature only in the Prologue) and the little known, like teacher Dorothy Bishop. This is a lovingly compiled and written series of vignettes of lives, often of outwardly unremarkable working people, who nurtured their talent for art and created beautiful and arresting paintings, capturing the world immediately around them. 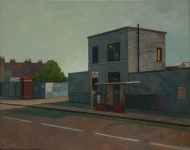 Preferring unusual view points, I liked Peri Parkes’ 1980 view of the back of the terraced houses in Condor Street, Stepney and Doreen Fletcher’s almost Edward Hopper like pictures of roads, buildings and bus stops, also from the 1980s. James Mackinnon’s Twilight was also a favourite. All these were not for sale, though other pictures were. The exhibition brings us bang up to date with vibrant pictures of the very recent past, showing the colourful, almost present day East End, its diverse mix of people going about the business of life. The exhibition runs at Abbot and Holder’s Museum Street premises until 10th February. Be prepared for quite a lot of stairs, but it’s worth the climb. This entry was posted in Art, Books, Culture Vulture, London and tagged Books, London, Worth a visit by juliej. Bookmark the permalink.